Thank you SacEDM & Waterjet, Inc and Mr Dan Folk! PART decided to get pretty ambitious this winter, forming a 2nd NRL team while balancing the VEX season. 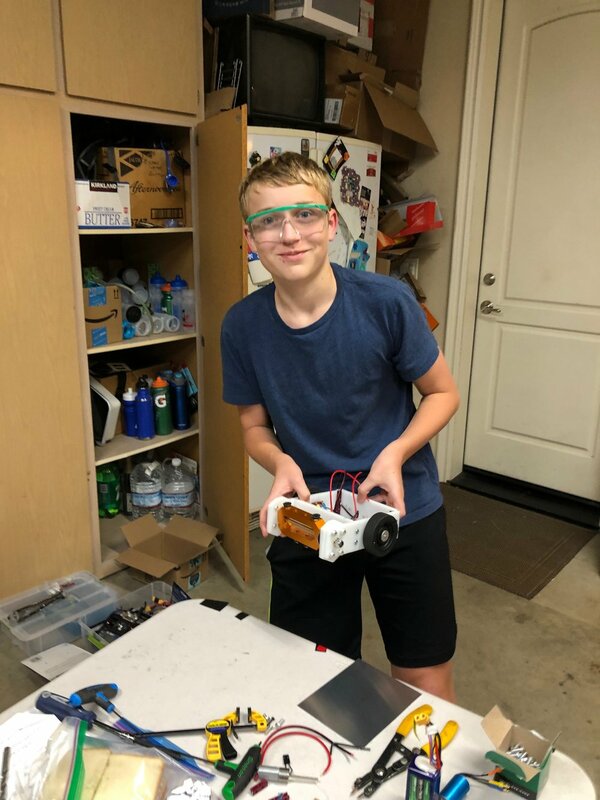 Team Scott was born, and the team members worked hard to design a new horizontal bar spinner combat bot for the SparkleCon Smash VI tournament. Due to unforeseen circumstances, Scott needed some last minute help in machining/fabricating their parts. We reached out to SacEDM & Waterjet, Inc , Specialists in CNC Machining, Waterjet and EDM SacEDM is located nearby, in Rancho Cordova, CA. Dan Folk, owner, was incredibly responsive and supportive of the team, and provided the critical water jetting services needed for Scott to get ready for the tournament in time! Mr Folk delivered the water-jetted components in just a few days after receiving the Drawing eXchange files from our Fusion360 model! Washing Machine also received new sidewalls. SacEDM’s motto is “Get it Right the First Time, Every Time”, and as you can see, they did an awesome job! We were amazed at the turnaround time and precision! Team Scott finished in 2nd Place in the NRL Division at SparkleCon Smash VI , and is now in the redesign process for our trip to NRL Nationals May 17-18! Thank you again SacEDM and Dan Folk! Cavitt Cyber Cowboys 9537C and 9537D are competing in the VEX State Championship this weekend! Congrats to @cavittjuniorhighschool teams 9537C and 9537D for reaching the VEX State Championship event, held this Sunday at Google in Sunnyvale. 9537D Qualified by winning the Design Award at an earlier competition - largely based on the strength of their amazing engineering notebook! 9537C focused on robot skills as their qualifying path, and at the last regular season tournament, scored 29 total points, ranking them 10th in the entire State, easily qualifying for a skills-based invitation. Both Granite Bay based robotics teams have strong student-led teams and are in good position for them to do well this Sunday! 3 weeks, 3 tournaments - we have a lot to catch up on! First up - Thank you Mr Dan Frank, Rocklin High School! PART has been busy….crazy busy! Building 6 different bots for 3 tournaments, in two different robot sports, VEX and Combat Bots. We’ve had a tremendous amount of support from the Placer County community that we need to recognize! First up….Dan Frank, from Rocklin High School, and FRC Team 6644! Mr Frank opened up his manufacturing classroom/machine shop to help out our NRL program on short notice for some steel machining! Our team members were absolutely amazedly by the shop and sophistication of Dan Frank’s program. . Check out this amazing video to learn more about the Rocklin CNC program, Mr Frank’s approach, and the support he gathered from Titan Manufacturing and others in the community! Good luck to Rocklin High FRC 6644, the Automic Automatons, at the upcoming FRC Regional in Davis March 20-23! NorCal Rumble VEX Tournament Recap: 81818X wins Robot Skills & Design Awards, 81818A receives Energy Award! The PART VEX teams competed at the NorCal Rumble VRC Tournament on Feb 9th - a quick turnaround for the club after the big road trip to the SparkleCon Smash VI combat tourney on Feb 2nd. 81818S and 81818A made some dramatic improvements since their first tournament in December! All 3 teams advanced to the elimination rounds of the tournament. 81818S was the #15 seed alliance, and in the R16 pulled of a major upset of the #2 seed, and then knocked off the 10th ranked alliance to make the semi-finals against 81818X! At first it looked like 81818S might pull off yet another upset to make the finals, but a field technical fault was declared, and in the replay, 81818X/824C came away with the victory. In finals, 81818X/824C combined for a strong lead out of auton, but came up just a bit short in a 15-13 loss. The judges came away impressed with the design and engineering around the complex 81818X bot, awarding them 81818X the Design Award for the most professional approach to design. 81818X also had the high skills challenge score of the day and received the Robots Skills award. Finally, we are proudest of 81818A - our all freshmen team received the Energy Award for their extraordinary enthusiasm through out the event! The local junior high team, 9537 Cavitt Junior Cowboys also attended the event. 9537B finishes 9th in prelims, and made it to the semi-finals against the eventual tournament champions. 9357C had another strong showing as well, ranking 14th in prelims and making the elimination rounds. All seven 81818 and 9357 teams will be competing this weekend at the VEX Google Signature event, with both State Championship slots and Worlds qualifying opportunities available. PART and Cavitt Cyber Cowboys are proud to represent Granite Bay robotics, and the greater Placer county area, at these high profile, highly competitive events! Congratulations to Cavitt Jr. High School Cyber Cowboys team 9537D for winning the Design Award at the Golden West RoboStangs tournament! 9537D made it the tournament finals, coming up just short in a close match. The award qualifies 9537D for the VRC State Championship on March 3rd. Earlier this season, team 9537C received the Judges Award at the Sacred Heart Middle School tournament. All 4 teams (9537A, 9537B, 9537C, 9537D) have all made the semi-finals in at least 1 tournament this year! Cyber Cowboys is an after-school, competitive robotics club for students attending Cavitt Jr High in Granite Bay. We are thankful for Principal Jennfer Platt's strong support of STEM education and the VEX competition teams - PART includes alumni of team 9537. The Cavitt program inspired them to pursue competitive robotics and technology project in high school and potential careers!. SparkleCon Smash VI Trip Report - PART's Combat Bot "Scott" takes 2nd place in NRL Division, Washing Machine is the Rumble King of the Ring! PART returned to Southern California for the SparkleCon Smash VI combat bot tournament on Feb 2nd! Huge thanks for Professor Martin Mason and Bad Kitty Robots for hosting such an awesome event. Historic rains pushed the venue from Fullerton to the Mountie Makerspace at Mt San Antonio College. PART had the best view of the arena from our pits! 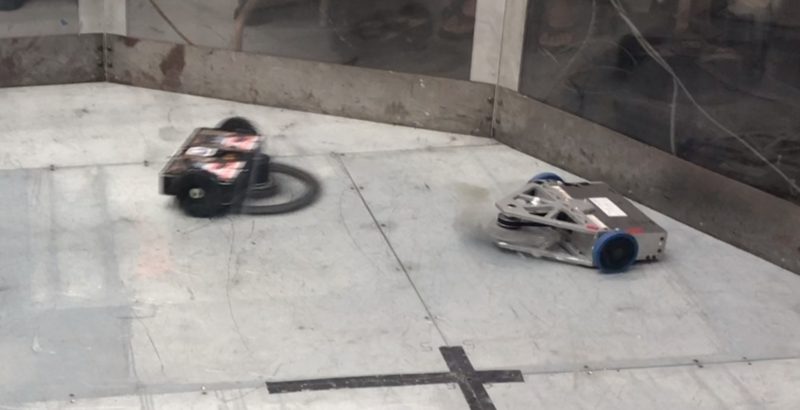 The team brought three robots to its 2nd combat competition, with the new bots coming down to the wire, completed just two nights before the competition. The Dryer - the club’s first 3 lb beetle weight bot! ”Scott” had a great run , making it to the finals against Toe Biter without suffering a loss, defeating Fist Bump, and Wiggles along the way despite challenges with the horizontal weapon and tensioning system. Team Scott constantly rallied throughout the day working through mechanical issues, even upsetting Toe Biter in their first face-off. But Scott’s run came to an end in the finals as Toe Biter was up and fully running. Driver Matt Vasquez quickly took aPART Scott in successive matches, destroying Scott’s weapon system and wheels. Congrats to SparkleCon Smash VI NRL champions Toe Biter , and to Team Scott for working so hard in the weeks before and the day of event to earn 2nd place in the NRL Division! Washing Machine came in with high expectations, but had a rough tournament. The bracket paired Washing Machine in the match #1 against Harmadillo from the host team. Harmadillo was looking for Obliteration revenge, and came out with new armor, weapon system and an amazing paint job! Harmadillo took it to Washing Machine as they hit head on, taking some good chunks out of Washing Machine’s chassis and dominating the driving. After one too many hits, Washing Machine’s new power switch wiring came loose from the shock and Harmadillo claimed a decisive victory. After quick repairs and 2nd match victory, Washing Machine faced Harmadillo once again, this time in the losers bracket with Harmadillo’s weapon inoperable. Unfortunately for Washing Machine disaster struck - Washing Machine powered up fine, but just as the match started the bot lost connection without any contact and was counted out 15 seconds into the match. Washing Machine rallied to win the King of the Ring Title, taking out their frustrations in the end of tournament rumble — destroying Toe Biter (NRL champ), knocking out Quicksilver (12 lb champ) and generally causing destruction through the ring! More importantly, the team learned some valuable lessons on where to improve the bot heading into Nationals in May. Last up, our smallest bot, The Dryer, the team’s first 3 lb beetleweight bot designed, built and driven by Evan! Finished literally the morning of the event due to some motor/gearbox issues, The Dryer faced off against 2 strong, veteran beetleweights and proved to have a solid weapon system and chassis. The drive pairing of gearmotors and wheels was a weak link however, and The Dryer was knocked out by Gobble Gobble in an exciting match. We really appreciate the builders at SparkleCon Smash VI who supported and gave Evan feedback on his first build — the biggest thanks to Bradley Warren Hanstad for providing replacement motors at the tournament, and giving Evan great feedback/ideas and some equipment to tinker for version 2.0 of the drive. Check out more pictures of the event on the PART Facebook page, and match videos on the PART youtube channel! PART VEX 81818X TOURNAMENT CHAMPIONS @ TURNING POINT AT THE BAY - QUALIFIES FOR CA VRC STATE CHAMPIONSHIPS! Congratulations to PART’s junior VEX team, 81818X on their win this weekend at Turning Point By The Bay! 81818X earned a qualification spot to the California VRC State Championships, and will be competing March 9th at the Sacramento site! 81818X dominated the preliminary rounds and went undefeated, but were ranked 3rd due to their tendency to run up the score! During alliance selection, the Robohawks (8000E) and Cheesy Poofs 254M (Bellarmine Prep Academy) both selected teams from their own schools. 81818X selected the 11th ranked team, 254X from Cheesy Poofs for their alliance. Our local middle school team, Cavitt 9537 had 4 teams in the tournament, with 9537A, 9537C and 9537D all ranked well in the combination high school/middle school event. The alliance of 9537C/9537A even faced 81818X/254X in the quarter finals. 81818X/254X were a strong duo throughout the playoff rounds, defeating the #2 seed in the semi finals. In Finals, they got an early lead in the match and played strong defense for the overall victory Thank you to team 254X and congrats to both 254X and 254D for moving on to State! All 3 teams will be competing Feb 9th in Yuba City and Feb 16th in Mountain View (Google Signature). Teams 81818A and 81818S are in the middle of their redesign / rebuild process for the upcoming competitions. Our hope is to have both of them qualify for the State Championship as as well and join 81818X at Sierra College to showcase Placer Advanced Robotics and Technology to the region! The Sacramento site qualifying spots have been filling fast with powerhouse NorCal/Bay Area teams - always among the best at Worlds each year. Team 81818X is already working on a new design to step up it's game for the strong competition ahead with dreams to advanced to the VEX Worlds Championship at the end of April!